HOPAC students work really hard. HOPAC uses the Cambridge International Curriculum (IGCSE, or rather O-levels and A-levels). A-level classes (11th and 12th grades) are definitely at least equivalent to AP classes in the States, if not higher. I spoke to one teacher the other day who felt that the content of her A-level psychology class was actually post-college graduate level. Last night Gil and I went to an Awards Ceremony for two of our students. Lotta received the highest marks on both her Business Studies and Biology exams of any student in all of Tanzania. Dorothy did the same on her Geography exam. Gathered at this ceremony were students and families from schools all over Tanzania. It was held at the fanciest hotel in town (where President Bush himself stayed in February) and the British High Commissioner (who kept being referred to as "Your Excellency") did the ceremony. We were proud! I was Lotta and Dorothy's teacher for 5th and 6th grades. This is now Gil's fourth year as their Bible teacher. Both of them are a huge part of our lives and our kids' lives. We love both of them as daughters...who are now old enough to be our friends. They are now both seniors and we are having lots of conversations about college. I think I understand what it must be like for parents to have to send their 18-year-olds away! How I pray for God's grace and mercy to follow them wherever they go. ...a recent trip to the pool. There's a string of beach hotels about a mile from our house, so we like to frequent one of the pools there. This was Josiah's first time in a pool. It has been such a joy to be Josiah's mom this past month! We had visited him three times in the orphanage before we brought him home, and all three times, he cried incessently! The first couple weeks he was home with us, he was clingy and fearful. He had to be within two steps of an adult or he would scream. He didn't sleep well and he wouldn't eat anything except formula and basic wheat cereal. And whatever he did eat went straight through his system (and the doctor insisted he didn't have any parasites). Today marks the one month anniversary of bringing Josiah home...and he is a changed baby! He is curious and happy and gets into everything. He is attracted to balls like a magnet, especially ping-pong sized balls, because he can clutch them in his little hand and carry them around (which he usually does most of the day). He loves making noise and banging things. He gives us great belly laughs. He is eating voraciously--everything I give him, and his digestive system has leveled out. And...he is sleeping over 16 hours a day! No joke. It's like he is making up for lost time. I'll take him to the doctor again in about a week, and I can't wait to see how much he has grown! Thanks, Lord....from a Happy Mama! She is given a broom and a bucket. Every day, she does the same thing: Sweep the dirt off of the busy streets. With a scarf over her face to keep out the dust, and dodging traffic, she sweeps under the sweltering tropical sun. It's a government job, and I can't imagine it pays more than $2 a day. Yet she is a lucky one, because she has a job and gets to bring money home to her family. There are dozens like her throughout the city. Every day we see them sweeping. And I wonder: What does it feel like to be a street sweeper? And why not me? What would it be like if your next door neighbor lived in a tin shack with no running water or electricity, and rarely had enough food to go around? 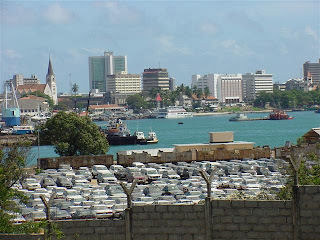 Dar es Salaam is a city of 4 million people. It is growing economically in leaps and bounds. The fancy hotels are overflowing with visitors here on business. New banks seem to be opening every week, with lines that go out the door. Our school, HOPAC, which costs $4000 per year for tuition, is bursting at the seams with a waiting list a mile long. The only other high quality international school in the city, IST, which costs more than $12,000 per year, is also bursting at the seams. There are many wealthy people in this city. However, the vast majority are not. Thankfully, we don’t see starving people in Dar es Salaam the way we did when I lived in Ethiopia as a teenager. 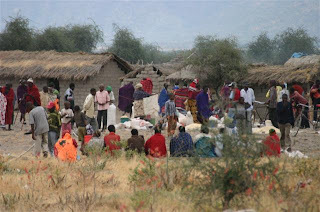 There are people starving in Tanzania, and I’m sure even in the city, but it’s not the norm. But that doesn’t mean that the majority are very far above it. Earlier this week, my house worker, Esta, asked me for an advance on her monthly pay. I asked her what she needed it for and she said that her husband still hasn’t found work and they are out of food. Since she had received her salary less than two weeks ago, the fact that she is asking for an advance for food is not a good thing. I gave her the advance, and some food, but inside I felt sick. Esta has worked for us for two years and is such a dear woman. She is about my age, been married for two years, and has a baby girl who she brings to work with her. She is a believer and is full of joy. But her life is hard. She and her husband rent two small rooms. Not a two bedroom house—two rooms. One for sitting and one for sleeping. She cooks outside and uses an outhouse. They have electricity but rarely use it. They do not have running water. Esta’s husband has been out of work now for over a year. There is a 40% unemployment rate in this city. We pay Esta about $80 per month, and this is her only job. In addition, we pay for almost all of their rent and cover all of the medical expenses for her and her baby. If she is still working for us when her daughter goes to school, we will help with school fees too. We pay over the going rate. Yet….we’re talking only $80 a month to live on, folks. Then there’s our life. We live in a four bedroom house that is (sort of) similar to an American house, though rent is about 4 times cheaper here. We have all the amenities, except for a dryer or dish washer, but I have Esta. We own one ten-year-old car. My pantry is always full of food. We are not living extravagantly by American standards. When we moved here, we carefully thought through our standard of living. We have been purposeful about the location and size of our house—we chose all the details for very specific ministry-related reasons. We live at or below the standard of living compared to the other HOPAC families. In fact, most of the Tanzanian kids at HOPAC live far above us. Yet I live with constant tension between our lifestyle and that of so many of the people around us—even those about 100 yards from our house. The truth is, even if we lived at a lower standard, as some of the missionaries in the villages do, we would still have more than most Tanzanians. We never have to worry about having enough to eat. We never have to worry about money for a sick child. We are allowed plane trips to the States every couple of years. Our children are guaranteed an excellent education and all the opportunity they will ever desire. When Gil and I go out to dinner, I think about how that one dinner was a week’s wage for many people in the city. If we go to a hotel for our anniversary for a night, we could easily spend a month’s wage of an average Tanzanian. I think about it when I buy dog food. Or Pringles. Or books. Or anything that goes beyond basic living expenses. Sometimes I just want to run away from it all. It’s just too hard. When Esta asked me for the advance for food, I just wanted to leave Tanzania and go back to America. I often just want to pretend that poverty isn’t really there. Of course, living in the States doesn’t make poverty go away. But in America, surrounded by people who live in luxury, it’s easier to live in denial. Of course, not everyone is rich in America. But even the poorest have electricity, running water (that won’t make you sick if you drink it), shoes, free education for their children, food stamps, presents at Christmas, a TV, and often even a car and a computer. More importantly, people in America have opportunity to get ahead. Most of the rest of the world does not. But there are no easy answers. How do we remain generous while staying within economic and cultural norms in Africa? What is the balance between generosity and fostering unhealthy dependence? How many “creature comforts” of western life can still glorify God? How do we really distinguish between “needs” and “wants” (which are very much defined by our culture)? Why do my kids get to experience Disneyland, bubble baths, dress-up clothes, swimming pools, and university, and the kids around the corner do not? Why has God allowed us to have so much and so many to have so little? And what is our responsibility in the midst of that? Think on poverty, my friends. Though I want to run away from it, God never desires us to put our heads in the sand. When not confronted with it head-on, it’s easy to pretend it doesn’t exist. In the end, I’m thankful I live with this tension. Heaven forbid I start pretending that this life really is heaven, and that I “deserve” comfort—as I am often so tempted. When my struggle ceases, I will be either in sin, or in Heaven. "Grace, you're not the mommy." "Please don't yank Josiah by the arm when you want him to come with you." "Please don't pick him up by the neck, either." "Please don't dump water on his head." "Please don't make him laugh while he is eating." It takes 4 times as long to get ready in the morning. It takes 4 times as long to get in and out of the car. A two-year-old can be amazingly independent. A two-year-old can get into a heck of a lot of trouble while being independent. How exactly do you get two children to sleep in the same room at the same time? How do you eat dinner at the same time as your two children? What do you do with the second child in the grocery store? How do you cross a busy street with two children? Grace is learning the meaning of the word "brother." Last week, a young couple was at our house. Grace asked the guy, "What's your name?" He told her. Then she asked him, "What's your brother's name?" pointing at his wife. Yesterday we borrowed some puzzles from a friend. One was a Mickey Mouse puzzle. Grace is in love with Mickey Mouse even though she has never been to Disneyland or even seen a Mickey Mouse cartoon. But very excitedly, she took the puzzle over to our Jack Russell, Minnie. "Look, Minnie! It's your brother! It's your brother!" Grace: "Mommy, my brother is crying." (Thanks, Grace, I didn't know). And when I talk to him: "Mommy, he can't talk yet." Grace is a great big sister. When Josiah cries, she says, "Don't cry, Sweetie. I'm right here!" And then she says, "I'll get you a spoon!" For some reason, she's convinced that will make him stop crying. And sometimes it actually works. The doctor confirmed he is indeed little. Below the 5th percentile actually. But we are fattening him up! Making a variety of noises with finger and mouth is one of his favorite things to do...this must be a boy thing? Preparing for all those car and truck and helicopter noises. The other day I had strapped Josiah in the high chair at lunch time, then ran into the back of the house for a moment. When I came back, Grace was feeding Josiah unbaked cookie dough with a spoon. Ummm...Mommy's little helper?! "This is my brother Messiah!" she proudly tells everyone. The other day I was letting her watch part of the Jesus film for children. "Mommy, they are talking about Messiah!" she told me excitedly while pointing to her brother.